Vanguard Cleaning of Minnesota | Dependable customized janitorial services. Our church cleaning services help ensure your worship space – church, temple or mosque – is always clean and welcoming. Vanguard Cleaning Systems franchisees understand that your place of worship is more than just a building; it’s a gathering place, a place of refuge and celebration, and an active part of the community. But as visitors and congregation members gather, so do germs and allergens. 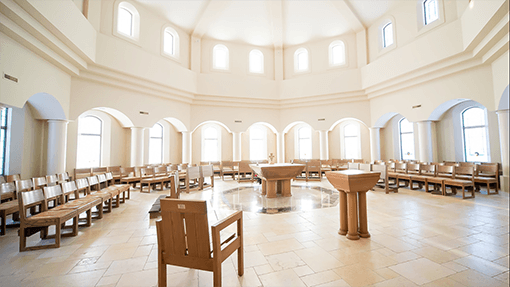 Vanguard franchisees are experienced in cleaning and sanitizing touch points unique to churches, mosques and temples such as pews or seats, sacred spaces and children’s education areas, as well as general event rooms, restrooms and entryways. Vanguard is a proud member of the Minnesota Association of Church Facility Managers (MACFM) and we have crews that have successfully completed VIRTUS Training as directed by the Archdiocese of Saint Paul and Minneapolis, giving them specialized expertise in this area. There are many things to consider before choosing a cleaning service that’s right for your church, temple or mosque and the people who spend time there. For example, what’s right for a small congregation is not a good fit for a multi-campus worship community. The Vanguard Cleaning Services team is happy to help you consider all your options with this FREE comprehensive guide: “8 Steps to Hiring a Commercial Cleaning Company“.